In Target Dashboard you can set up regular email digests for each of your dashboards at the click of a button, but did you know that you can also set up conditional email alerts? In this Quick Guide you will learn more about the last option; custom email alerts, when you might use them, and how to set up your own. You can set up custom email alerts in Target Dashboard that will send out a notification email to you, or any of your employees, colleagues or stakeholders when certain conditions (that you set up) are met within your data. They can be used to send out alerts for either high or low performance, and are a great way of quickly and easily initiating decision making. These alerts can be configured to send out an email to selected Target Dashboard users when certain KPIs fall below or rise above target, and you can include in the alerts a specific chart or a link to a dashboard. You can even filter your alerts based on the categories available in your data, allowing you to send out different alerts to different people, based on the same data. Custom email alerts are quick and easy to set up, and you only have to do it once for each alert, which can have multiple recipients. The alerts are then sent out automatically depending on what happens in your data, and they really come into their own if your data is updated automatically via the Data Grabber, Dropbox, or one of our custom solutions. Imagine that you have three teams in three different locations that each team has a manager that’s responsible for the team’s performance. You have a table in target dashboard where each location is represented as a category that is updated daily and contains all of the performance figures for the three teams. You could then set up custom email alerts to be sent out to each of the location managers, based on data from just their own location. With the same data you could also set up an alert for the overall performance of the 3 teams to be sent to a higher level manager, alerting them of overall high or low performance. In the same manner, these alerts are a great way for the manager of a sales or customer service team to keep track of the performance of individual team members. They can be used to spot low performers and initiate training schemes, to spot a downward trend early on, or to discover and reward high performers. 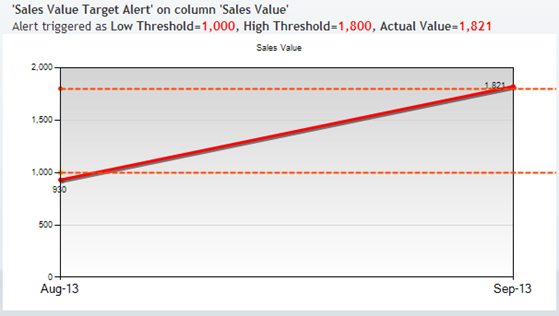 Another trick that you can use if you just want daily reports on a figure that you are charting, is to set up a very low threshold that you know will always be met. This ensures that an email alert will be sent out each day for that metric, giving you a daily report. For example, if I’m measuring the number of sales done by my sales team, and I want to know how they are doing regardless of what the results might be, I can set the high threshold to a figure that I know will always be met, thus ensuring that an email is sent out each day. Continue reading to find out how to set up your own email alerts! Step 1: Go to the data table from which you would like to produce your email alerts, and click on the tab called Exception Alerts, located to the top of the table. This is where we will create and configure our alerts, and set up recipients. If you haven’t previously set up any alerts, this page will be empty bar a link to add a new alert. Step 2: Click on Add New Alert. This will take you to the alert creation page, where you can choose what column to create the alert for, what filters to apply, and what thresholds to set. To the right on this page, there is a preview that will update as you input your settings. When setting your thresholds, you can choose to set up just a high one, just a low one, or both thresholds. In the example above I have set both a high and a low one since I want my email alert to be sent out both when I am above target, and when I fall below it. I have chosen not to add a filter to my alert, but should you want to, you can do so by clicking Add Filter. You can also pick a chart to include in the email, as well as a link to a dashboard. Both of these are optional. From here you can also send out an example email, to make sure the alert looks exactly the way you want it to. Step 3: When you are done setting up your alert click Add to save it and move on to setting up your recipients. Step 4: Now we need to set up who will receive the alert. By default, you will receive the alert yourself, since you created it. This can be changed, however. Once you have saved your alert, you will see some new options at the top of the page. Hover over the recipients list, and click on Edit Recipients to add new recipients or to delete existing ones. Step 5: To add another alert, click the Exceptions tab at the top again. This will take you to a list of your existing alerts for this data table. The one we just created will appear here. From here, you can add new alerts and manage your old ones. If you want to create an alert for another data table, just go into that table and go through the steps above. You can of course always find more information on how to use all of Target dashboard in our Help Centre, or you can contact us on support@targetdashboard.com with any questions you may have.